You may have heard of a little stretch of beach known as the Redneck Riviera. That would be Panama City Beach, FL. A town known for its abundance of spring-breakers, hairy backs and keg stands. After enjoying a to-go lunch staring at the sea, I believe it should also be known for its fish tacos. The Mahi Mahi fish tacos at Schooners in PCB are the bomb. The grilled fish rests in flour tortillas and is topped with shredded cheddar-jack over a bed of key lime slaw. 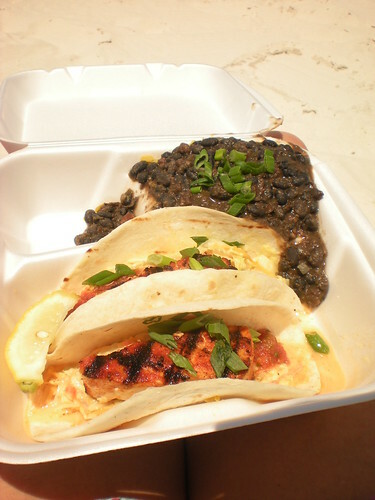 Get the black beans and yellow rice on the side, stick your feet in the sand and enjoy the sound of the ocean. now that’s what i’m talking about! looks fantastic! does this mean you’re gonna make me some?